Single Tooth Implant | Brooks Dental, P.C. If you have lost a tooth, you likely feel alone as you deal with low self-esteem and the new challenges the empty space created. Although tooth loss may seem isolating, 120 million Americans are missing at least one tooth, too. You do not need to live with an incomplete smile. Brooks Dental, P.C. has the solutions you need. We provide the most preferred options to replace a missing tooth, including a dental implant in Winthrop. Every tooth in your mouth has an important job to maintain your oral health and functions. When you lose even one, both decline. Now, you have difficulty chewing and speaking; however, there are more severe consequences brewing beneath the surface of your gums. The missing tooth causes your jawbone to deteriorate because it is no longer stimulated by the root. Your remaining teeth will eventually lose support, causing them to drift toward the open space. This increases your risk of tooth decay, gum disease, and additional tooth loss. You will also notice changes to your facial structures as they also lose support, like premature wrinkling and sagging of the skin. 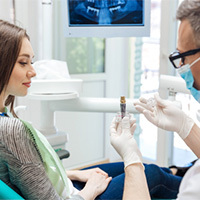 You can overcome the complications of tooth loss using a treatment option that is right for you. Fixed Bridge: A fixed bridge, also known as a bridge and crowns, is the most conventional treatment because it is convenient. An impression of your mouth is used to design a prosthetic tooth. 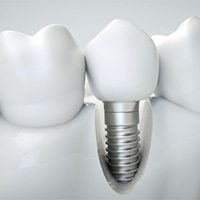 It is held in place by reshaping your adjacent teeth to place custom-made dental crowns over them. A bridge can last for an average of 5 years before needing to be replaced; however, it will require you to alter healthy teeth. 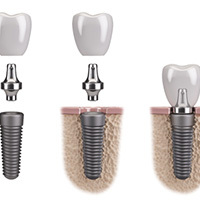 Single Unit Implant: A biocompatible implant post is surgically placed into your jawbone to act as a new root. This stimulates new bone growth to allow them to fuse together. An abutment is attached to the post to connect a custom-made dental crown. You can regain the next best thing to your natural teeth using a treatment that can last for several decades. All-ceramic material makes it look natural. Reduces your risk of cavities, gum disease, and additional tooth loss. Does not alter healthy teeth. Potential to last for a lifetime. Rebuild a Functional Smile Today! You can overcome the complications of tooth loss to invest in your quality of life. We perform the comprehensive consultation you need to replace your missing tooth. We find the right solution to meet your needs while accommodating your lifestyle. Take your first step to rebuilding your smile. Contact our office today for a consultation.